At this time of year we often use our slow cooker 2-3 times a week. It's not only for the convenience but also the lovely warming smell of a hearty meal that fills the house. On a Sunday we always like a roast dinner but there are a number of slow cooker meals that we like which are a suitable alternative to putting a joint into the oven. If you use diced beef then the cooking liquid makes a great gravy. In this case it is the beer that gives a satisfying richness and depth to the sauce. I've also added kidney as it is good and cheap way to bulk out the main meat. 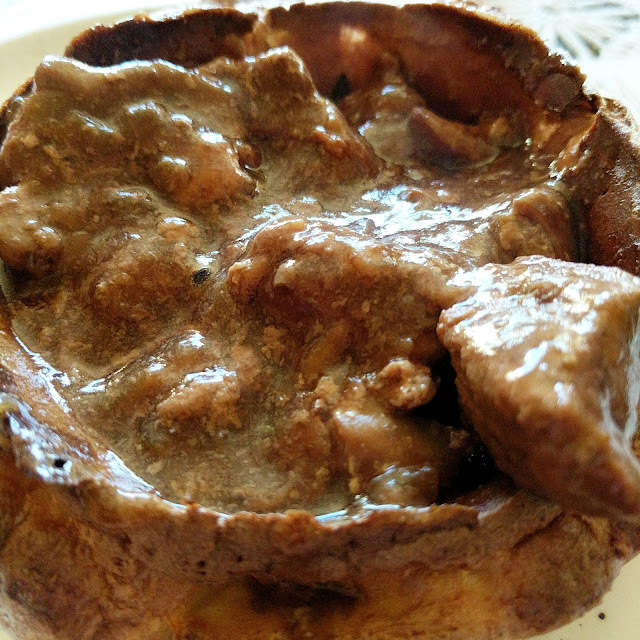 To complete this 'Sunday roast' we like to serve them in giant Yorkshire Puddings. Equipment: Slow cooker/Crockpot, large frying pan, small bowl. 2. Heat the oil in the frying pan. Meanwhile toss the beef and flour together in a small bowl. 3. Put the beef into the frying pan and brown off the beef. Remove from the pan with a slotted spoon and out into the slow cooker with the kidney. 4. In the same oil fry the onions until softened. 5. Add the beer and bring to the boil. 6. Crumble in the stock cube and then stir in the Worcestershire Sauce. Finally add the thyme and black pepper. 7. Transfer to the slow cooker and cook on HIGH for 4-6 hours or LOW for 6-8 hours.